You may have noticed that Michael Graves has some designer goods at Target. I stopped in for only the second time to look for and pickup a new coffee maker as ours decided to quit. 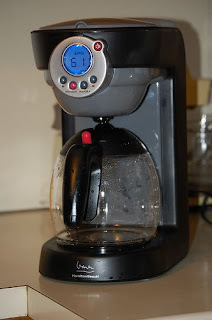 His coffee maker was in the mid-price range and seemed to have some good features to make it worthwhile. It is manufactured by Hamilton Beach. The water container comes out and makes it easy to load.